Vogue Avenue and I go way back! It's been an awesome journey working with them for the past few years and I'm still a huge fan of their brand. First of all, it's always great working with an awesome team of genuinely nice people, it makes me feel like everything I do with regards to them is totally worthwhile. Not only do they provide excellent service for their customers, the apparels offered by them are also a huge factor into why they're still standing strong in this industry. They make sure that everything offered up on their site are of superb quality and of the latest trend. It's tough finding a reliable online store these days with the industry getting extremely diluted, but you can totally trust Vogue Avenue to satisfy your shopping desires. Here are several apparels I picked and kept for myself from their latest collection. You've probably already seen some of them on my Instagram. Rompers have got to be every Singaporean girl's must-have apparel. It's everywhere! They're basic necessities that you can just throw on if you're in a rush or simply lazy to put an outfit together. Not only are they super comfortable, they're also weather-friendly, in the sense that they'll keep you feeling cool in our humid climate. Next, I got my hands on one of their latest maxi dresses in Red. I was torn between the White and Red one but I decided to go for this instead since Chinese New Year is coming. It may look SUPER red on the site but trust me, it's a lot darker in real life which I prefer so it's not too loud and striking but a lot more sophisticated and classy. I've always thought that a red maxi dress is must have item. It's great for special occasions or events that requires you to dress up a little more than usual. I like how this dress has a rather thick inner lining so you don't have to worry too much about your undergarments being seen through the chiffon material. hahaha. I also enjoy the flow of the dress and how it sways as I walk making me feel like royalty. hehehe. A classy dress that you can wear for almost any occasion, good investment I'd say. As mentioned earlier, rompers are all the craze these days! Oooo that rhymed. But what's really trending are those manufactured with thick Neoprene material. Yes, we're talking about apparels that need no ironing. hehe. I picked two of such rompers from Vogue Avenue, one of which is the Renova Origami Bustier Romper and the other is the Valeria Bustier Romper. Both of these rompers fit me like gloves! Not much styling is needed for both apparels hence they earn the description : Effortlessly gorgeous. hehe. I felt real comfortable in both rompers and I especially love the fact that I didn't have to iron/steam them at all. All of the apparels I had mentioned above are already up on their site! Here's one of their dresses from their upcoming collection that I wore at Hard Rock Hotel a few weeks back. 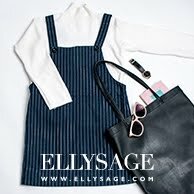 A very simple, casual dress that's presentable for school, dates or just a day out with your girlfriends. Looks great paired with sneakers, heels or boots. It's definitely something to keep a look out for on their next launch. If I'm not wrong, it also available in various colours. I must also compliment on the material and quality of the dress. It is fully lined and feels pretty thick so you don't have to worry about VPL etc. especially since it's white. I assure you that you'll feel comfortable and confident in it. Shall end this post with my favourite picture from Vogue Avenue's latest outdoor shoot. Teehee!